International Women’s day , March 8 is a day set aside to celebrate social, political, cultural,and economical achievement for women around the world. The theme for this year is women in the changing world of work, Planet 50:50 by 2030 while the goal is to ensure actors step up gender equality towards a planet where world of work works for all women. This requires that policies should be set in place to promote and protect women in their workplace and the economy at large, bridging gender gap and promoting gender parity. To commemorate this year’s IWD, African Youth Initiative on Population, Health, and Development (AfrYPoD) organised an event co-sponsored by eight (8) other organisations including Connected Development (CODE). This event brought together people from different youth led and women centered organisations. The 3- hour long event was interesting, event filled and informative. It covered experience sharing from all the organisations present, organisations were asked to share experiences on how they have taken bold steps in helping women cater for the welfare as well as promoting women’s right. Connected Development was not left out as we highlighted how we use our ‘Follow the Money project’ to track funds meant for rural communities, projects like- the World bank funds for the Girl child education project in five northeastern states in Nigeria and the clean cook stove project, these projects were highlighted as they are gender specific. The highlight of the event apart from the experience sharing was when Connected Development officially launched her report on “An examination of girls’ education in Nigeria and Follow the money 2016 report and Project Pink Blue’s Nigerian language translation of Breast cancer materials for women. Resolutions from participants include increased sensitization and drive advocacy for the domestication of Violence against person’s prohibition Act in states while promoting women empowerment. 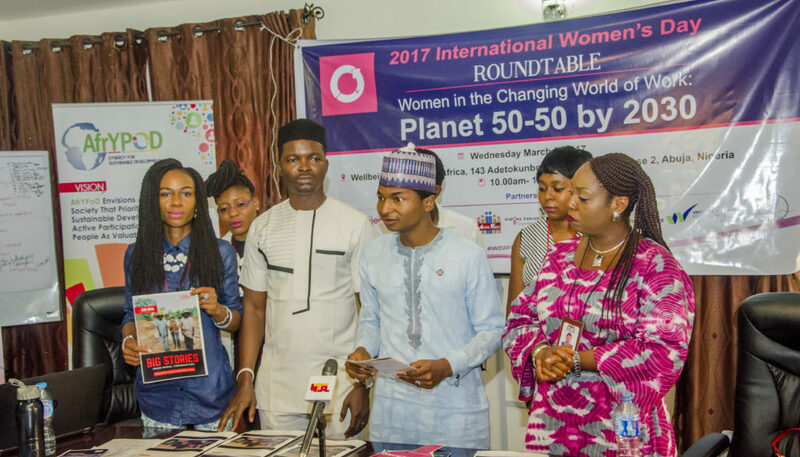 I was particularly excited to have attended the event, seeing young, vibrant, and intelligent women ready to take up challenging roles and working towards the actualization of planet 50:50. Moreso, the men present pledged their support towards helping us achieve gender equality. It was a rich, informative and engaging event and I was particularly inspired to #BeBoldforChange and proud to be a woman.